Britain has been in the news quite a bit recently, but mixed in with all the political noise there’s one salient point you can be forgiven if you missed—employment is at record levels. The 2018 average unemployment number was just 4.2% (source). The question remains, where should you be courting passive job seekers? Social media provides the answer. Numbers for social media use are universally high. 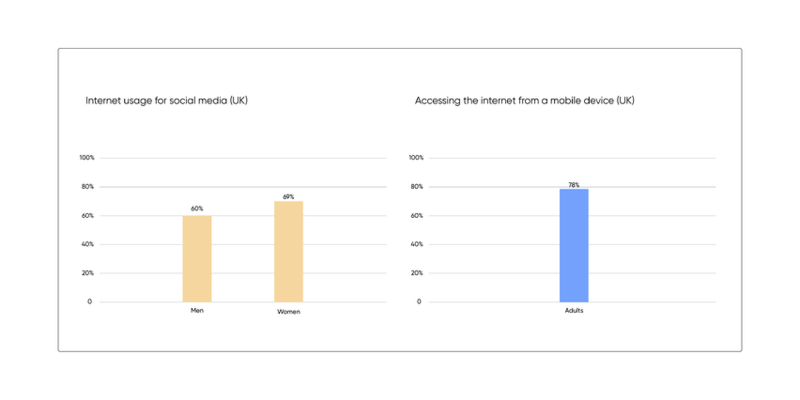 Men report using the internet for social media at a rate of 60% and women a rate of 69% (source). Meanwhile 78% of all adults in the UK used a mobile device to access the internet (source), making social media apps a prime target for your recruitment marketing efforts. Add to that the average daily use of all social media outlets being 114 minutes per day for 2017 (source), and you can see that if you aren’t taking advantage of marketing your recruitment efforts via social media, you’re missing a huge number of potential applicants. Below, you’ll find a list of the top 5 recruitment channels in Great Britain, along with further information about how you can make the best use of each. Source information for the user numbers we cite can be found here. Standing strong as the largest social media outlet in the world, Facebook claims north of 35 million active users in the United Kingdom alone. It is also one of the most flexible of the options on our list, allowing text, image, video, and ad content as media options for your recruitment marketing efforts. Facebook also provides one of the most robust ad systems of any entry on our list, letting you fine tune your reach, conduct easy A/B testing of content, and even perform cross marketing with its subsidiary platform, Instagram. Demographically speaking, Facebook covers the widest range of the sites on this list, with a bit of a focus in the 23-37 bracket with 80% of respondents to a recent poll saying they were active users of the site. Things get tricky when we look at the younger bracket with the 24 and under audience leaving the platform for rivals like Snapchat and Instagram (demo source). 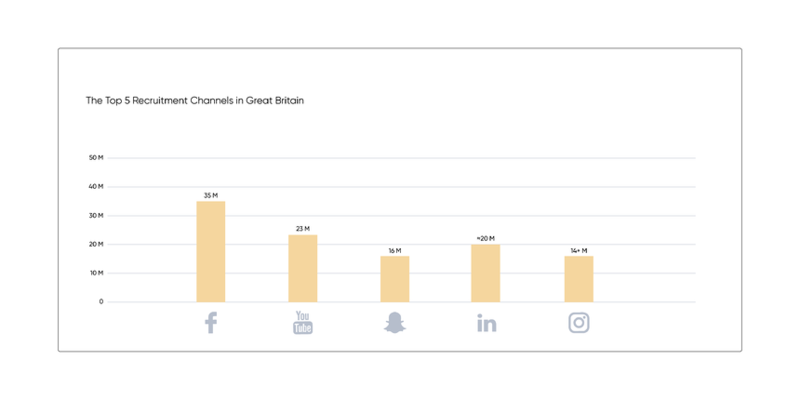 While not strictly a social media platform per se, Youtube does boast the second highest user base on our list with just over 23 million users in the UK. That’s a lot of potential applicants watching videos that could be featuring your company culture, EVP, and testimonials. Because of its exclusive focus on video, Youtube is an ideal venue to highlight your employees and their feelings about how your company lines up with their values, or their insights on what a great work environment you offer. It also offers an opportunity to flex your creative muscles: film a tour of your campus with a soundtrack by a local band, then zoom in and talk to employees about their experiences working for such an amazing company. Video production does set the bar for entry a bit higher than our other items on this list, but the potential payoff, we feel, can more than make up for this. By showcasing your ability to create engaging, creative video content you’re also showing potential applicants how far-reaching your company’s resources are and that you value their input on this process when you respond to their comments on your content. Sitting at about 16 million users in the UK, Snapchat represents another visual media outlet. It also favors a younger audience, with the primary user being in the 18-35 age bracket. Snapchat is known for the self-destructive nature of posts and the fact that there is no timeline (like on Facebook, etc. ); however, there’s one fact that often escapes mention, posts stay in followers inboxes until they’re viewed. This means that once you build a following, these people will see your posts, if only briefly. With the self-destructive nature of posts mentioned above, two things are clear about marketing on Snapchat. You need to commit and be creative. Someone needs to be monitoring your account constantly, able to reply to comments on your posts, reciprocate by commenting on your followers posts, and generally be available to engage with your audience. It can be challenging to hold someone’s attention with a picture, so intersperse some short video clips, or consider sponsoring a filter for a day so users can turn their faces into a giant widget. Sporting a user base of approximately 20 million Britons, LinkedIn is holding strong in the fast paced and ever-changing world of social media. That’s 20 million primarily high earning, college educated, 25-44 year old professionals. That’s a rich data pool to dip your recruitment marketing toes in. And yes, we realize this is more users than Snapchat. In this case, its employer branding system combined with demographic differences led to LinkedIn being dropped down to 4. LinkedIn is, however, the first outlet on our list that offers multiple options for how you can reach your target market. 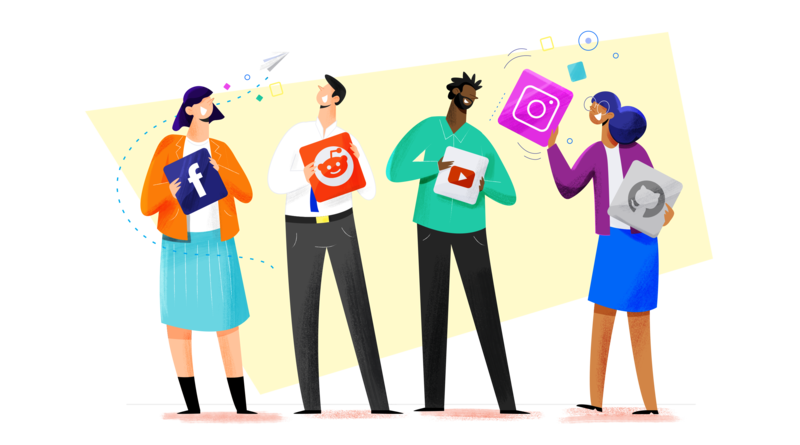 Company pages, specialty recruitment pages, groups, ads, and InMail ads are just a sampling of the avenues open to your marketing efforts on this platform. As with Snapchat, and all other channels we talk about here, engagement is fundamental. You’ll need to have someone monitoring your presence on LinkedIn regularly in order to respond to questions and comments on posts, and reciprocating by commenting on the posts of your followers. With around 14+ million users in the UK, Instagram sits at #5 on our top 5 list. With global usage in the 700 million user range, Instagram’s reach is wide. Its user base in the UK skews toward the 18-35 age range, with roughly 81% of internet using adults there using the platform (source). The fastest growing feature of Instagram is called Stories, which allows users to put together a series of pictures or video clips to tell viewers a story. This is a large, and growing, market for companies to position themselves in to spread the word about their EVP and company culture. String together high-quality pictures of your employee lounge with short testimonials from current employees talking about what a fantastic office culture your company has, and the potential reach to passive job hunters is nearly endless. The world of social media is ever changing, what remains the same is that overall usage is high and climbing every year. Keeping up a marketing presence on a variety of channels gives you the best chances of reaching your target audience of passive job seekers.